Hi Averie – I made these pie bars last week and they were a huge success, so I made them again today for superbowl sunday. This time I added a 1/2 tsp of almond extract to the crust, which added a nice flavor. 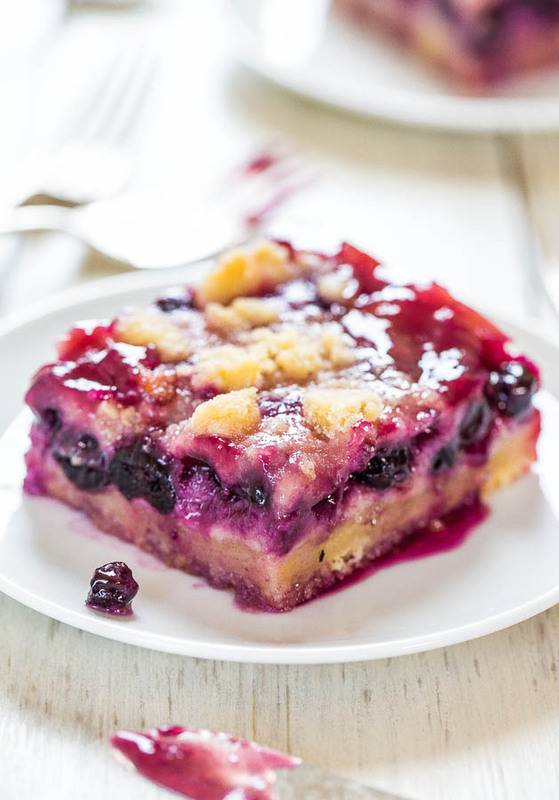 I also tried your blueberry crumble bars last week. These pie bars are definitely more sweet dessert-y as you mentioned, and they were my family’s favorite between the two. Needless to say we wiped out our stock of frozen blueberries! Thanks for the delicious and unique recipes! Love your site! Thanks for trying the recipe and I’m glad it came out great for you! And also for trying the crumble version. These are definitely more dessert-ey and nice to know which ones you preferred. I can I tell you how grateful I am for this recipe. I have used it over the last two years for all kinds of events. Backyard barbecues and picnics as Well as formal high tea event. Mostly For my friends. I have done many different variations…. like making more crumble (or adding oats and coconut) and adding different fruits like mulberries, but I always come back to the same recipe. I have seven children and cannot thank you for the ease of this recipe. I basically use one bowl and stir each step accordingly. I wish I could post pics, but you get the idea. A HUUUUUGE THANK YOU!!!!! You have brought many smiles too many people. 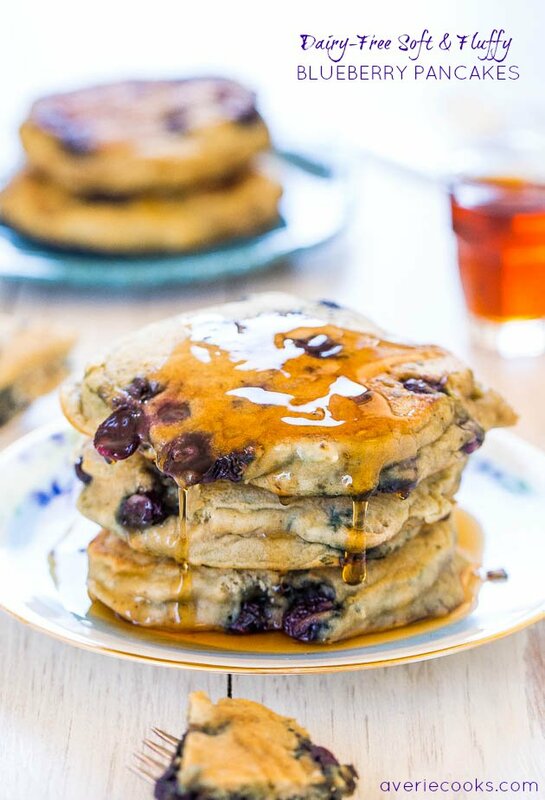 Thanks for the glowing feedback and so glad this recipe is an ultimate hit for you! And kudos to you for being a mom of 7!! Just made these! Tweaked the recipe a bit though, didn’t have sour cream or yoghurt so I used cream cheese (about 5oz, omitted the flour), baked it in a 9×13 so I 1.5x the crust and eyeballed the amount of filling and blueberries needed, I also added some oats into the crumble, they turned out great! Thanks! Glad your tweaks worked and that you loved the bars! 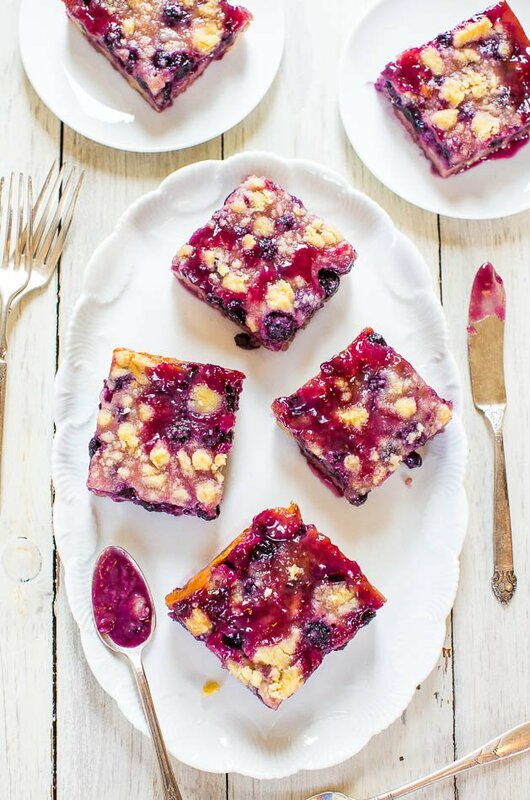 Made your blueberry pie bars. Delicious! So easy! Next time I would bake only 50 minutes. Definitely a keeper. 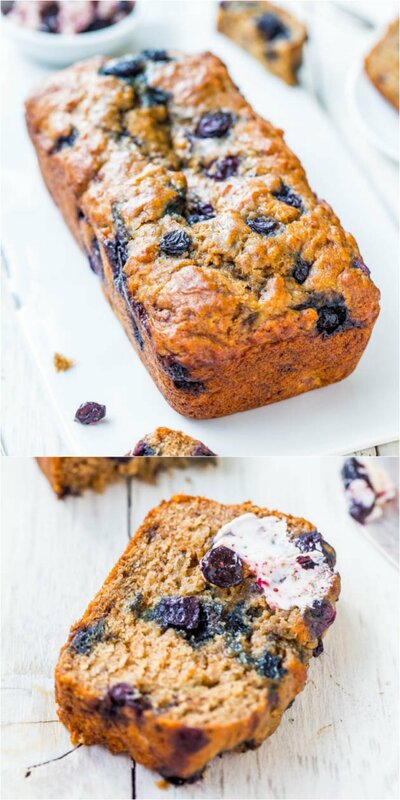 All ovens (and the juiciness level of the berries) vary, so yes bake until it’s done in your situation. Glad you loved the bars and that it’s a keeper! Hi! Has anyone ever tried to double this recipe and make in a 9 x 13? Would you have to bake longer than 60 minutes? I’ve tried the original recipe and is very delicious! Now have to make for a larger croud. Generally when you double a recipe, you don’t necessarily need to add much time to the baking overall, but it can vary. I would just keep an eye on things and bake until it’s done. 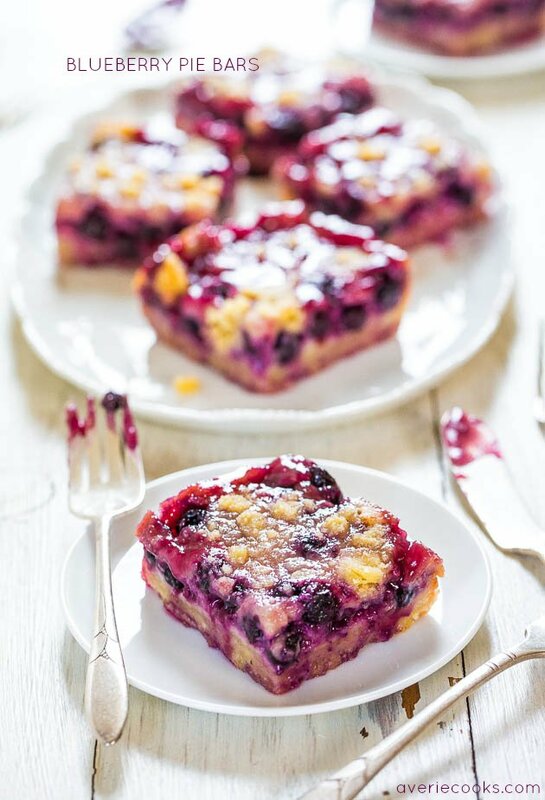 Just made the blueberry pie bars for my husband and he loved them! I’m not a fan of blueberries. Do you think I could use frozen peaches? Glad your husband loved them! I would use fresh peaches rather than frozen if possible but I think either will work. Hi, I made these bars a few days ago. 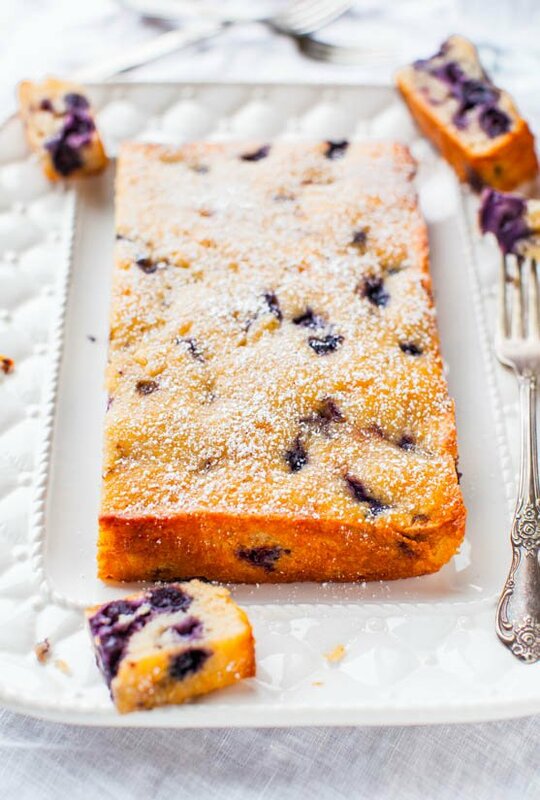 I used fresh blueberries and I think that’s why the bars didn’t turn out as “moist” as yours, because you used frozen blueberries instead. I didn’t really like the bottom crust, it was very hard – something I am not a big fan of. However, the flavor of these bars was outstanding. I just wished there was a “softer” bottom crust recipe. I have never had these turn out anything other than very juicy and the crust isn’t too hard at all. Berries vary in their juiciness as do ovens, climates, etc. I would suggest reducing the baking time by 5 mins or so based on what you wrote. Glad you loved the flavor overall. no baking soda or powder for the crust? 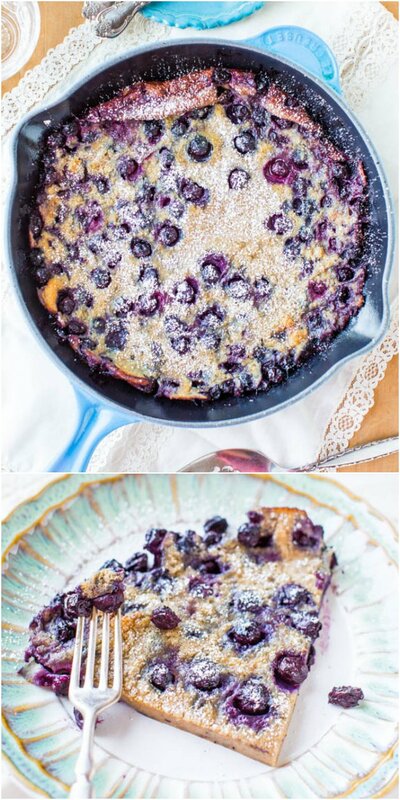 Hi — do you think this would work without the filling, just the blueberries? So impressed with this !!!!! My son who haaaaaaates bluberries just devoured this and honestly i wasnt sure mine would turn out …substitude reg strawberry yogurt and tapico instead of cornstarch and to my surprise it worked amazing and was glorious!!! I’m sure it could although I haven’t personally tried. Do you think mixed berries would work? Ie blueberries, raspberries and blackberries? I made recipe last week and I also thought crust was hard, but patience is necessary. After I cooled in refrigerator overnight the juices absorbed and was absolutely amazing! I also think when u press the crust into pan, don’t press as hard as you can. Press firm and evenly with no loose crumbs but I find that if press to hard the juices can’t absorb as well. I’ve made recipe 3 times now and I learnt from my mistakes. I’ve tried mixing raspberries and strawberries with blueberries and it’s delicious. The different colours look great. Also after you drop berries into filling save that bowl! There’s a juicy berry mixture left in the bottom of bowl. I drizzled it on top of the crumble when only few minutes left to bake and it looks and tastes so yummy! It’s the cherry on top! I really recommend it. I just doubled the recipe in 9×13 pan and it’s baking now ( that smal dish is gone too fast) .I will let you know how long it took and finished result. Thanks for sharing this recipe, it is way better than a pie, your right! It’s a huge hit and super easy with little clean up! Glad you agree it’s way better than pie and I have also made it with different fruits and berries. Glad you keep on making it! Hi, Averie! Thank you so much for this recipe, these bars are amazing! I’ve already baked them several times, and they’re always a hit! Thanks for trying the recipe and I’m glad it’s a keeper! Could you use applesause instead of the egg.? Not sure but I would personally use an egg. Deeann – did you try it without the egg?! 🤷🏼‍♀️ My son has an egg allergy. But we are picking blueberries next week and these look sooooo good! Was hoping someone had tried a substitute! This is an excellent recipe, super easy and very yummy! I was worried the filling wouldn’t set but it was perfect, I may have overbaked it a bit tho’ or the wild blueberries just didn’t create as much juice as yours because it didn’t bubble and the juices weren’t dripping down like your pictures. My crust was still nice though so like someone else mentioned the trick might be to not pack it too hard. 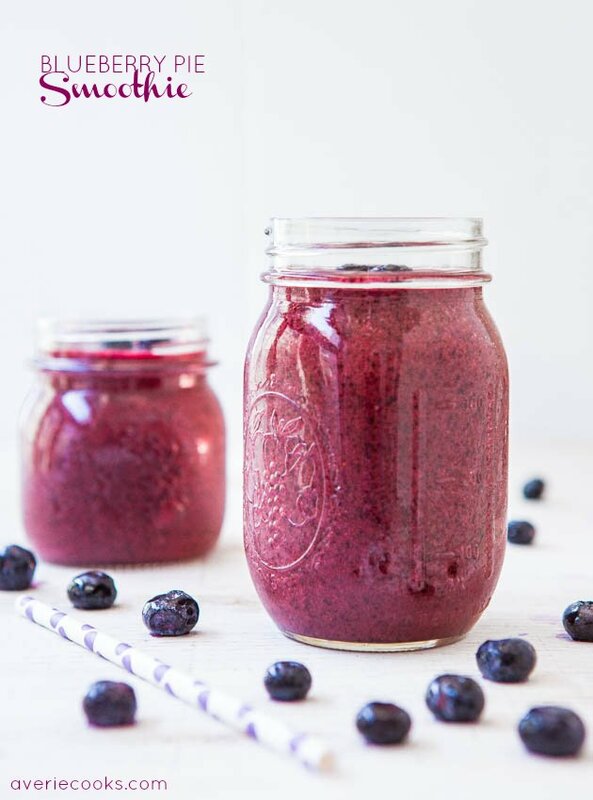 I am going to use this recipe for a lot of my frozen fruits because it’s just so easy and versatile. Only thing I would change is less sugar in the fruit but that’s just a preference. Thanks for sharing! Why don’t you give your viewers the option to “PinIt” your recipes? I do. Hover over the top left corner of any photo and you can pin it. Made this today,Very good, very easy, Great flavor!!!!! Thus is such an amazing recipe with wonderful flavours,so pretty to serve,yet so easy to make . Another great hit Averie. These are amazing! My friends loved them at a BBQ last weekend & several asked for the recipe. I am making them again today for another group of friends!. I cooled them for 2 hours on a rack and then put them in the fridge overnight & they were very easy to cut into squares. 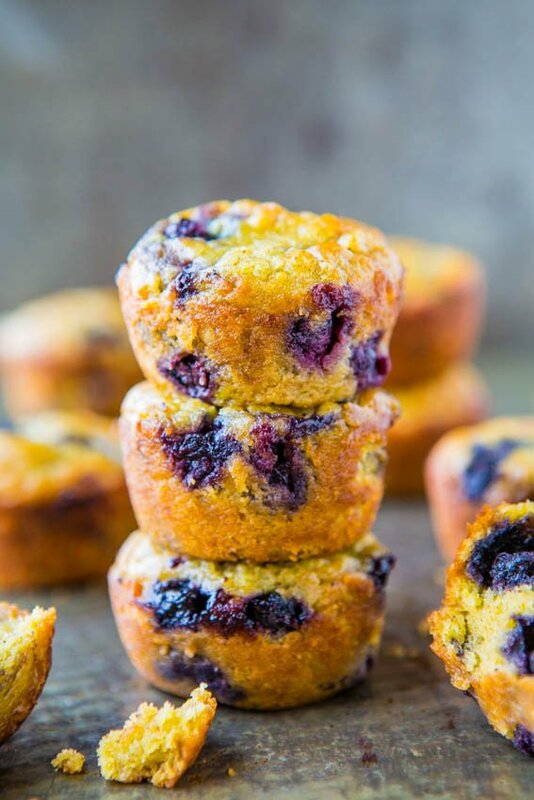 Don’t miss out on these easy, delicious, make ahead crowd pleasers! Thanks for the 5 star review and glad you love this recipe and are making it often! Absolutely delicious! My son is visiting when I made a pan to take to a July 4th party we were going to. I had to made another pan this morning for him to take home with him later tonight, even before we went to the party! It was hard keeping the first pan around for party time! No alterations to the recipe. It’s wonderful as is! Thank you for posting and the great pictures! Thanks for the 5 star review and glad this was a hit without any changes necessary! 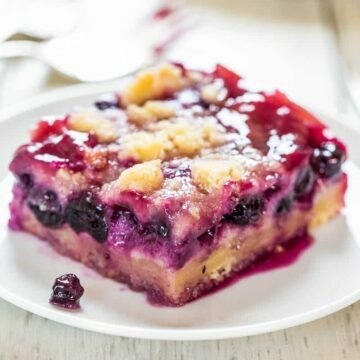 I have made this with fresh blueberies and was delicious, wondering about trying it with fresh rhubarb not sure I’d to much water in it for this recipie. Have you tried this? Thanks for the 5 star review and glad it was delicious! I don’t bake much with rhubarb so really can’t give advice on that one. Thanks for the 5 star review and glad it was devoured! 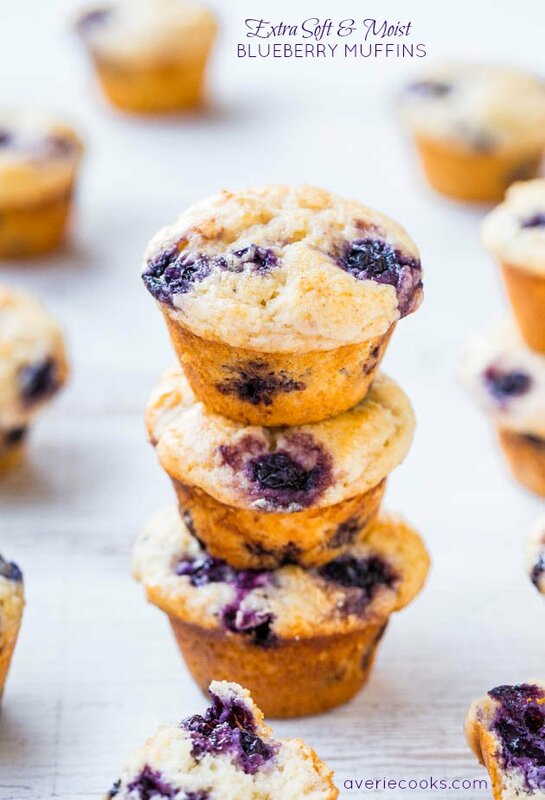 Very easy and yummy. Definitely on the keeper list. Want to try your Crustless Blueberry Pie next. Thanks for the 5 star review and glad this is a keeper. 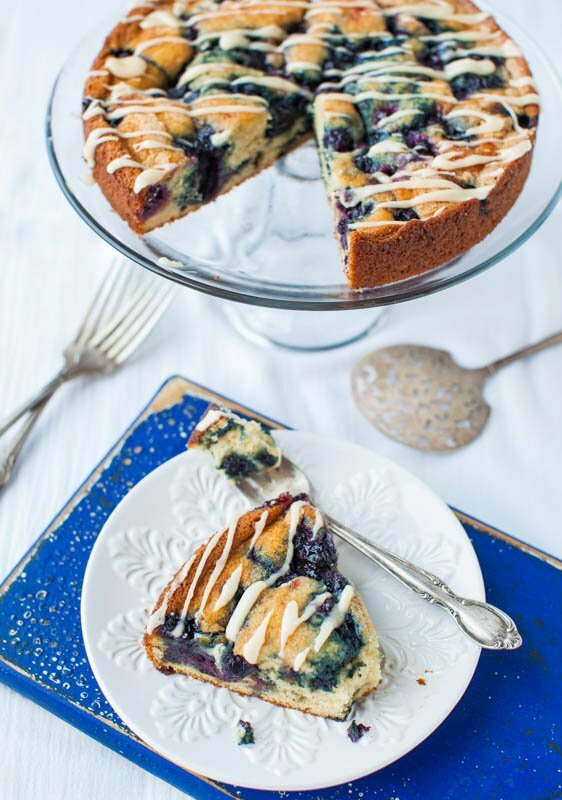 Definitely try the Crustless Blueberry Pie next!